Ari Miller, chef-owner of Musi BYOB in South Philadelphia. What’s going on at Front and Morris Streets in Pennsport in the corner restaurant space across from a sound barrier along I-95 south? Ari Miller sweeps a hand across the snug dining room: “We are paying reparations for the fact that we didn’t study harder in high school, basically," he said brightly. “We’re cooks. We’re opening a restaurant. This is Musi." Miller, backed by sous chef Dana Pellicore and line cook Caitlin Bias, has set Feb. 8 as opening night at the 34-seat BYOB, whose open kitchen and spare, luncheonette-like atmospherics are pretty much left over from the space’s previous occupants, South Helm, 1st Ward, and Langostini. As for Musi’s food, “we’ve been sort of casually referring it to as relationship cuisine," Miller said. The relationship also extends to the customer, he said. Eventually, Miller said he’d offer a fixed menu that he won’t call a tasting menu. 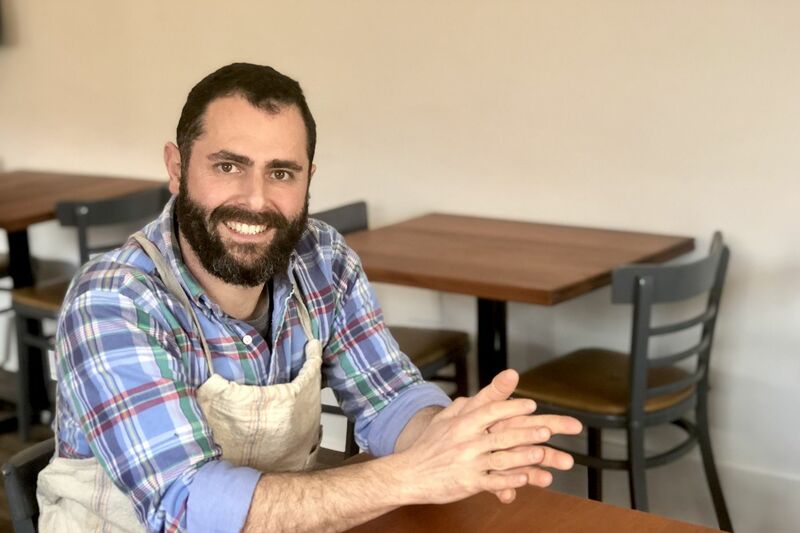 The name is pronounced “moo-see” (”like what a cow says and what your eyes view,” Miller says) and it’s named after the Bucks County-bred Miller’s favorite fishmonger in Tel Aviv, where in his pre-chef life he picked bananas on a kibbutz before waiting tables and working as a journalist. After this place was shut down, he moved to a bar called the Minzar. “I didn’t know how to hold a knife yet, and I would show up, and they’d hand me a wad of cash and send me to the Carmel market and be like, ‘Make it happen,’” he said. During a trip home, he looked up Michael Solomonov, a friend of a friend. Miller did so-called stages -- basically, short-term jobs -- at Solomonov’s Zahav and Percy Street. “Mike told me I’d have a job waiting for me if I ever want to come back,” Miller said. By then, the political situation in Israel was weighing on Miller’s mind. “Between air-raid sirens and a job offer, I was ready,” he said. After working at Fork, Miller landed a job with Kulp and Ellen Yin next door at High Street on Market. A brick-and-mortar restaurant has its own set of challenges. “Learning the business side is a lot of trial and error,” he said. He has received business guidance from Angie Branca of Sate Kampar, Kiki Aranita of Poi Dog Philly, and Judy Ni of Baology. It is open Thursday to Monday, starting at 5 p.m. Miller said Mondays will become “a more family, neighborhood, or industry night with a simple menu of soup, salad, a lasagna, and dessert.” Reservations can be made through Resy. Note: Miller is not the same Ari Miller who owns 1732 Meats.